I’ve always been a fan of Dominique Ansel Bakery ever since it been opened about two years ago. I adore his French pastries like the DKA and especially the cannele. Even his quasi recent release of the über, intensely decadent, fudgy chocolate flourless cookie that is the stuff chocoholics dream of. Anyway, I made a visit over this rainy weekend and was craving for Chef Ansel’s gorgeous pastries. I bought the blood orange poppy seed cake ($5.75, seen above). 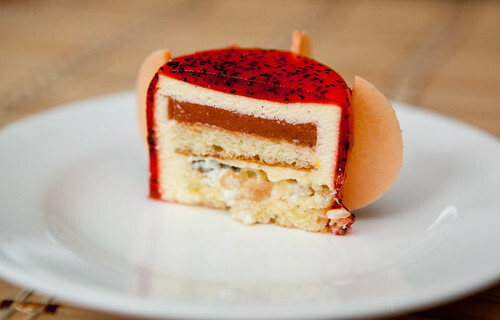 It’s a shiny, vibrant red-orange cake filled with creamy vanilla mousse, firm blood orange gel and delicate almond slivers. To me, it tasted like a creamy, almond-y cake with sweet-acidic orange undertones and bits of crunchy almonds for texture. 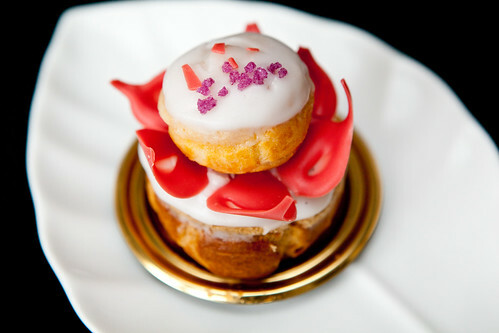 The white rose religieuse ($6) is a two-tiered choux pastry filled with delicately flavored white rose and Tahitian vanilla cream with pink-red petals. 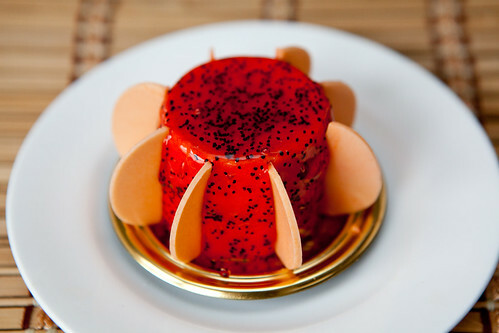 I liked the balance of flavors and the luscious creaminess of the rose-vanilla pastry cream.